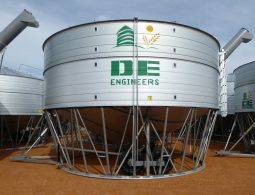 DE Engineers Field Bins are the most sought after field bin on the market being the strongest, fastest running bin that is fully engineered not to fail when operating with side walls that don’t crumple when filling. The last thing you want to worry about when loading trucks is having to shut down a hydraulic choke every time you stop the auger so our Field Bins are engineered to start while full of grain making loading much faster. You can even use our remote “Electro” Clutch (pat pend) to operate the Field Bin auger from inside the truck cab for faster, safer operating. nb/- all ‘well Engineered’ tractor driven machinery are fitted with slip clutches for added protection and should be adjusted not to spin while running. ps/-Some manufacturers get it wrong???? 1. All field bins should be able to run at 450 rpm (ours can run up to 700) and the faster you spin an auger the faster the grain will flow. 2. Slip clutches are not designed to spin when in use. 3. ‘Pop rivets’ are not used on our silos or field bins. 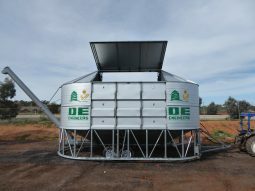 Introducing our new ‘Wide Mouth’ field bins that will be shown for the first time at Wagin Woolorama. With an opening of nearly 3 metres wide to make filling easier and increase usable capacity. Stronger, longer lasting Field Bins. Our field bins are guaranteed not to crumple while loading by using the heaviest wall section in the industry. These bins are also fitted with heavy duty 2 tonne axles on single axle field bins with ‘New’ Landcruiser tires and rims, walking beam axles are on field bins over 50 tonne capacity for a much smoother ride and all bins are fitted with PTO slip clutches to protect the driveline. 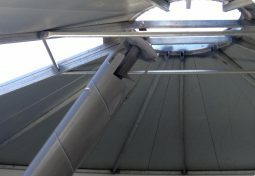 Our Field Bins use a large vibration free gearbox drive which runs smoother and faster (up to 700 rpm) than traditional ‘double universal joints’ to shift more grain faster and have the largest (weather tight) double opening doors for ease of filling. With steeper augers, tall sided trucks are filled easily while being less likely to be damaged by grain trucks. 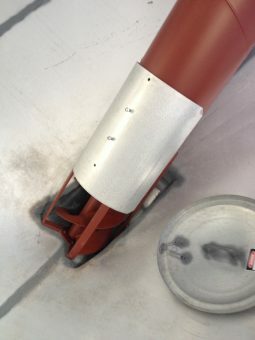 Manual choke plates are just another one of our unique innovations: Primarily used only when field bins are new to polish the augers, reducing power requirements during the first few loads. 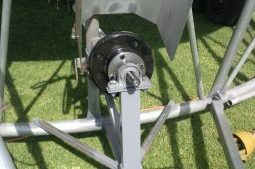 Choke plates can be adjusted to suit older tractors with less horsepower or to slow the grain flow when needed without the use of messy hydraulics. 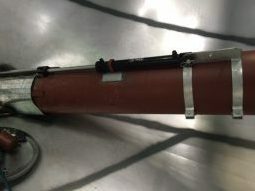 Hydraulic auger chokes are available for regulating grain flow but not necessary while running DE Engineers field bins. With very little modification, DE Engineers 55hp Electromagnetic Remote Control Clutches (Pat pending) can be fitted to most Ag products. When fitting a slip clutch to a field bin, as with any ag product it is important to make sure your slip clutch is tensioned correctly because these clutches engage instantly. Get the most out of your field bins with a hydraulic bubble up auger. 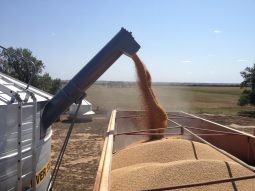 76 tonnes of wheat or 55t of barley in a 14′ (4.27m) wide bin. Easier and safer to transport on road and through farm gates. Fill the whole bin through hydraulically opening doors.